In our unending quest to be permanently powered-up, 24-7, we love nothing better than checking out the latest innovations in portable batteries. To that end we take a quick look at a powerpack that is both pleasing on the eyes and on your phone's battery... the Boompods Powerpod. We've reviewed a few headphones and speakers from Boompods in the past and always been impressed by the great combination of performance and low price. 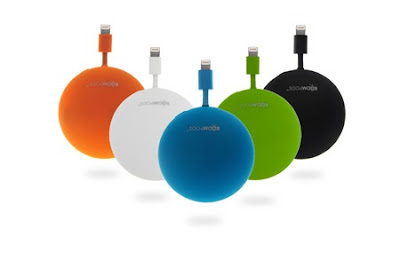 Boompods products always look, well... the same, being minimal in their design yet bold in colours. The Powerpod is no exception. You'd be forgiven for mistaking this as a pair of the Earpods headphones we reviewed here, as the bulbous plastic case is almost identical in proportions. You can't crack this one open however, as inside there is nought but a 2300mAh portable battery. Which is a good thing. Pop out the small length of cabling and on the end you'll find a Micro USB connector to stick into your power-depleted phone. There is also, as you might expect, a Micro USB port to charge the Powerpod up (with the included USB wire), and an on/off switch, which is actually rare for a device of this size and price. And before you have a hissy fit; yes, there is also an iPhone version as well. Calm down, hair cuts. In use we found, using our trusted Samsung Galaxy Note 3, that the Boompods Powerpod provided almost a whole battery worth of charge. That means that, from totally flat, we managed to get the Note 3 up to about 90%. Obviously ours is a large screen, juice-hungry phone, so if yours is smaller you'll probably get a complete charge and change. 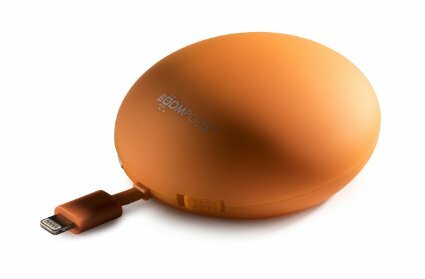 The Boompods Powerpod might be pretty chunky when compared to other, more expensive Chargers with a higher battery capacity, but there is no denying that those looks will appeal to many. If you already own Boompods headphones and Bluetooth speakers, this is your portable powerpack right here.